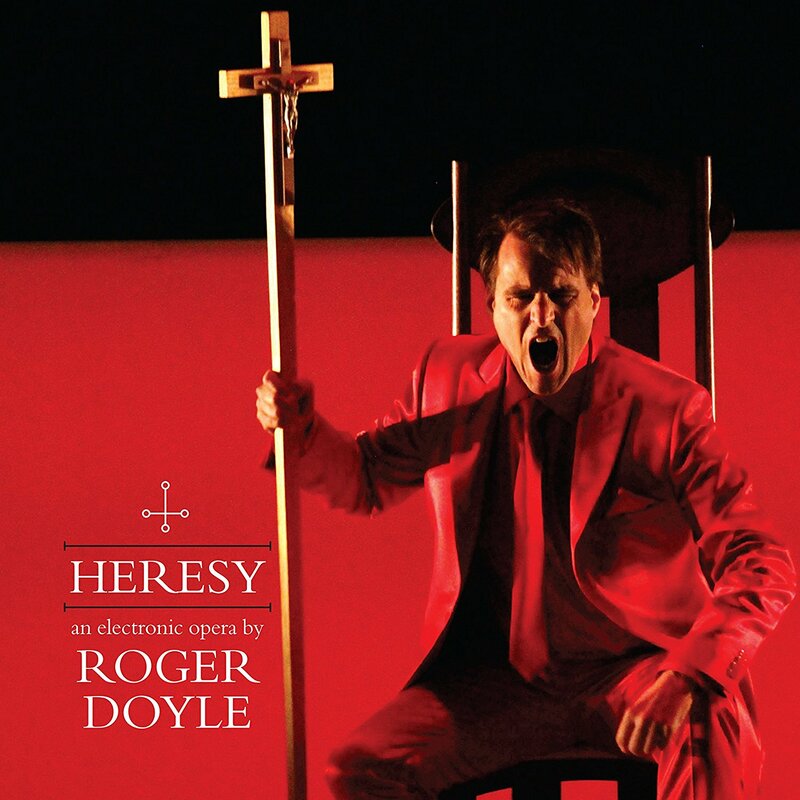 Roger Doyle is an Irish composer best known for his electronic music [see my review of his Time Machine] and he says in his introductory remarks to this recording that he never thought he would compose an opera. 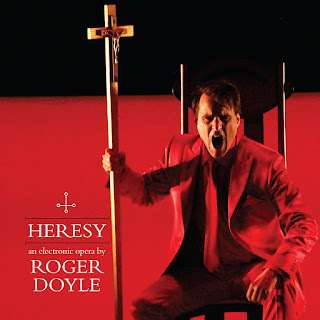 Yet what we have here is exactly that, Heresy for singers and electronics on the Heresy label with Morgan Crowley, Daire Halpin, Aimee Banks, Alex Smith, Caitriona O'Leary, Iestyn Morris, Robert Crowe, Ahmad Alkaran. Doyle presented a short development version of the opera in 2013 with the full version being premiered in Dublin in 2016. What we have here is a combination of the two with soloists from both performances, and in fact, Doyle's electronics developed after the 2016 performance so the CD includes these as well. The subject of the opera is the philosopher Giordano Bruno, who was burned at the stake in 1600 after a nine-year trial by the Roman Inquisition. The libretto, by Jocelyn Clarke and Eric Fraad, is concise and stylised. We have short scenes before King Henry III of France and Queen Elizabeth I, scenes from Bruno's trial and scene of him awaiting execution in his cell, along with visions of the Divine Sophia and Circe. The performers come from a wide variety of backgrounds including music theatre, singer/songwriters, traditional Irish music as well as Western classical, and voices include a talented young teenage soprano and a male soprano. The CD does not reveal how what we hear on the disc relates to what was heard in the theatre. No conductor is credited, simply music composed, recorded and produced by Roger Doyle. Intriguing questions remain. How are we intended to experience the piece in the theatre, are the voices heard through the sound system or does the work use the tricky combination of acoustic voices and electronic music. Doyle's music is the dominant force in the piece, a seductive, highly electronic texture which veers more towards metaphysical meditation than dramatic music theatre. I would certainly be curious to know how the piece actually works as drama in the theatre. Doyle's vocal writing is distinctive and rather ritualistic in nature, certainly there is little feeling of innate drama. Instead the incantatory nature of the vocal line adds another layer to the musical tapestry. Only with the trial scene do things approach conventional drama. The project has a rather attractive quirkiness to it, you feel that Doyle's approach to music theatre is somewhat at a tangent to much music theatre and opera today, which is no bad thing. And I have to confess that I found something of the 1970s concept album about the set, which is no bad thing either.